Download the latest version (v0.98d) for Minecraft 1.6.2 here. (Here's a more direct link if adfly is down or if you dislike adfly.) If you need a download for a previous version of Minecraft, check down below in the Older Versions section. All downloads will work for singleplayer and multiplayer. This mod introduces twenty-three new buckets in three distinct types. The types are big buckets, flimsy buckets, and special buckets. The big buckets hold more than your vanilla iron bucket, but the materials used to craft them are harder to obtain. They are the obsidian bucket, which holds three lava or water source blocks, the gold bucket, which holds four, the emerald bucket and quartz bucket, which hold five, the diamond bucket, which holds six, and the ender bucket, which holds eight. If other mods are installed which introduce copper, tin, bronze, steel or silver ores, or rubber, buckets of those types are added which hold one, one, three, or three source blocks respectively. All of these buckets can hold water, lava, milk, and mod liquids (see below for specific liquids supported). The second type, flimsy buckets, consist of wooden, cobblestone, and smoothstone buckets. These are easier to craft, but only last a short time with liquid in them. Careful using them towards the end of their life, especially with lava, as they will spill. Clay buckets differ slightly from those three in that there is no time limit on them, but they can only place and pick up 20 times before they break. They must also be fired in a furnace before they can be used. The special buckets each have distinct special functions. Two of them store things which aren't liquids. The infernal bucket holds thirty uses which are filled with water at a rate of six charges per source block. However, when you place a water, it places fire instead. It also gives you a short-acting fire resistance effect if you right click it into the air. The explosive bucket will allow you to defuse and store up to 32 live TNT for later use. The advantage of this, besides the obvious advantage of preventing explosions, is that when you place down the stored TNT it is automatically ignited by the bucket, so you don't have to carry around a bunch of levers. Three of the special buckets take in liquids but perform special functions instead of storing anything. The shimmering bucket takes in lava. Instead of filling up, the lava is transformed through some demonic power into some experience. Spooky. The icy bucket turns water into ice and lava into two pieces of obsidian. The black hole bucket will utterly annihilate through galactic gravitational pressure almost anything you right click that is not solid. In order of decreasing usefulness this includes those pesky lava bits and pieces that never seem to go away until you place a block in them, lava source blocks, water, snow (but not snow blocks), flowers, grass, ferns, nether portals, fire, redstone, tripwires, tripwire string, and rails. The two final special buckets are used on creatures. The slimy bucket and magma cube bucket scoops a little piece of a slime or magma cube into your inventory, turning it into a slime ball or magma cream. They require some time to rest, though, so you can only do this once per creature every three minutes. The ender bucket also has a special function: you can link it to any machine with a tank (default: left click). This linked ender bucket will then drain from and fill that tank instead of the bucket. You can craft obsidian with big buckets. Simply put a lava and water bucket in your crafting area and collect your obsidian. You can force a bucket to empty if you hold down sneak (default key: shift) and right click. This is handy if, for example, you want to empty out a water bucket so you can put lava in it. This is necessary because nothing will happen if you attempt to pick up a liquid and your bucket is full of that liquid. Most buckets have handy tooltips telling you how full they are or how much longer they will last. You can read help about each bucket by holding sneak while hovering over them. You can use big buckets filled with lava in furnaces. They will last a very long time! A filled ender lava bucket will last eight times longer than an iron lava bucket, or 8000 seconds, which is more than two hours. If you're in creative mode, flimsy buckets take no damage and big buckets don't empty out. This mod supports many mods: Buildcraft, Forestry, Railcraft, and Thermal Expansion. To a lesser extent it supports Dynamic Liquid Tanks, Industrial-Craft, Thaumcraft, ComputerCraft, and Useful Foods. It should also work with any other mods which implement tanks using Forge's ITankContainer. I'll do my best to support new versions of mods, but do let me know if something strange happens if you're playing. Tin, copper, bronze, steel, silver and rubber buckets can be created if a mod for that ore is installed. Tested and compatible with FTB Direwolf and FTB regular. It should be compatible with any other mod packs too. The ender bucket can also be linked to any machine with an internal tank (default: left click). This will allow you to place liquid blocks directly from the tank or fill the tank directly from the liquid. You can also fill other tanks from the source tank or drain other tanks to fill the source tank. Buildcraft: Oil and Fuel buckets of every material that was appropriate were added. You can right click on tanks and refineries to fill them with all buckets, and right click on tanks to empty them. You can put buckets in combustion engines to fill them. Forestry: Filling machines works. Biomass and Biofuel buckets of every material that was appropriate were added. These were the only Forestry liquids which fit in a vanilla bucket. Taking liquid out of Forestry machines will only take out one bucket's worth. Railcraft: You can fill and empty tanks and tank carts by right clicking on any part of them, and you can fill the liquid loader by putting a bucket in it or right clicking on it. Creosote oil buckets supported. Emptying Railcraft machines will only take out one bucket's worth. Thermal Expansion: You can fill and empty portable tanks with big buckets. You can fill and empty big buckets with the liquid transposer, though it will only fill or empty one source block at a time. You can fuel magmatic engines with big lava buckets. Dynamic Liquid Tanks: You can fill tanks with buckets, and link ender buckets to tanks. Industrial-Craft: The rubber bucket. Geo-thermal generators take lava buckets and fill up with lava. Thaumcraft: You can fill crucibles with big water buckets. Computercraft: The refuel() function on a turtle will use up one lava from a big lava bucket. Useful Foods: You can craft Milk Bottles and marshmallows with big buckets. This mod has a wide variety of configuration options (which can be changed in .minecraft/config/diamondbuckets.cfg). All buckets can be individually disabled if they offend you. The ability to craft obsidian with water and lava buckets can also be disabled, as can all mod liquids and mod ore buckets. The animated icons and tooltips can also be toggled off if you find them distracting. And of course, you can change item IDs in the event of clashes (or use the resetItemIDs option to move all item IDs at once). More buckets are planned, as well as more compatibility with major mods. Stay tuned! Give it a download (at the top of this post) and try it out! The latest version of this mod requires Minecraft 1.5.1. It has been tested on Forge 655, but it should also work on newer versions of Forge once they are released. You can download Forge here, or the latest recommended Forge build can be found here. To install Forge, drag the contents of the minecraftforge-universal zip file into your minecraft.jar and delete META-INF. To install this mod, download it and drag the zip file to your .minecraft/mods folder. If you don't have a mods folder, create it. Added upgrade recipes for big buckets. This can be disabled in the config file. An example: two emerald and a gold bucket yield a diamond bucket. Fixed null pointer exception when right clicking on a block not in the block list. Fixed interaction with railcraft tanks. Added localization support. Thanks to jimeowan for the public domain EasyLocalization class. Added a quartz bucket with a capacity of 5 source blocks. Explosive buckets now throw TNT a short distance instead of just placing it. Be careful! Fixed a crash bug for unnamed entities, like those in the Harken Scythe mod. Removed loop over entire inventory in favor of onUpdate() for flimsy buckets. You can now link ender buckets to tanks by left clicking on the tank. This will allow you to place liquid blocks directly from the tank or fill the tank directly from the liquid. You can also fill other tanks from the source tank or drain other tanks to fill the source tank. The mouse button (left or right) used to link can be customized in the settings, as well as whether or not you have to be sneaking. Help for each bucket is now displayed if you mouse over a bucket while holding Sneak (default: Shift). You can now light TNT with an explosive bucket, not just with an infernal bucket. Fixed using an explosive bucket on a deep pool of water or lava. Now it will fire a TNT now instead of doing nothing. Fixed recipe for black hole bucket (and upgrade recipe for ender bucket). Fixed milk buckets working in cake recipes. Added Easy Items recipe (only if Easy Items is installed). Iron rod + any lava bucket = blaze rod. Fixed NEI spam by switching obsidian, cake and UsefulFoods recipes to use OreDictionary recipes. Now the recipes will show up once, with the bucket graphic changing to show possibilities instead of having hundreds of pages. Known ender bucket linking bugs: The dimension must be loaded to drain or fill, so you may need to use a chunk loader if it's in another dimension. Also, if the liquid isn't one of the supported liquids, the bucket in hand might appear empty. Milk buckets can now be used in cake recipes in any combination. Added buckets to various dungeon loot. Better buckets have a lower chance of showing up. I didn't change the default bucket's chance, so you'll still get way too many of those. Useful Food support. Milk bottles and marshmallows can now be crafted with big buckets. 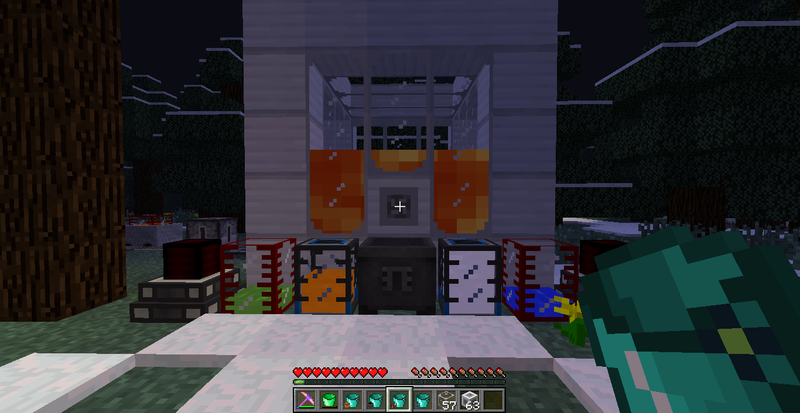 IC2 Geothermal generators work and add one lava per source block taken from the bucket. The IC2 team must have fixed this at some point. Thanks, IC2 team! Thermal Expansion tanks can now be filled and drained. Fixed Magmatic Engine filling. Fixed bug where picking up TNT in creative mode with the explosive bucket would place another one immediately. Support for filling and draining Railcraft tank carts. Talked to CovertJaguar, who says he has fixed buckets only draining if they are completely empty in Liquid Unloaders in the next version of Railcraft. Refactored fill code, so that any tanks from mods which correctly implements fill() and drain() for ITankContainer should now work. Please let me know if any mod's liquid tank or machine doesn't work correctly or at all. Thermal Expansion support. Thanks to KingLemming for making changes to make Diamond Buckets compatible. Liquid Transposers take big buckets and extract one bucket's worth of liquid from them for 160 MJ. You'll have to run the bucket through again to get all the liquid out. Magmatic Engines take big buckets and fills up with as much lava as it can. Portable tanks are not yet compatible. Thaumcraft crucibles are compatible. They somewhat worked before, but I have fixed the bug where non-water buckets could fill crucibles with water. Updated for 1.4.5 (Forge 397). Fixed mod interaction with Buildcraft, Forestry, Railcraft and IC2. Prevent water from being placed if a flimsy bucket breaks in the nether. Fixed bug where using resetItemIDs option could reset all settings in the general category. Fixed lots of bugs related to the new version of Forge. Updated to Minecraft 1.4.2 (Forge 337). Mod support will be fixed as mods are released. Added a configuration option to only show the empty version of each bucket and hide the filled versions in the creative menu. It also hides them in the NEI list. Performance improvements for flimsy bucket decay and slime timers. Railcraft tanks can now be right clicked with buckets anywhere, not just on their valves. Railcraft tanks now work with water and lava buckets even if buildcraft isn't installed. Railcraft tanks work with Creosote Oil buckets if Railcraft is installed (which it probably is if you're using Railcraft tanks) and biomass/biofuel/milk buckets if Forestry is installed. Note: If upgrading from a previous version, you may have to manually set some item IDs as the new bucket IDs are interspersed with the old ones. Or delete or rename config/diamondbuckets.cfg to get a fresh config file. Be careful and back up your save when upgrading any mod. Added missing rubber fuel/oil icons. Fuel and oil buckets are now deleted if buildcraft is uninstalled instead of causing null pointer exceptions. Fixed oil/fuel icons showing the incorrect bucket type if a different bucket was disabled. Mod ore buckets are no longer instantiated if no mod which implements them is installed. Again, will cause them to be deleted if you uninstall the ore mod. Compatibility with buildcraft oil and fuel. Compatibility with buildcraft tanks, combustion engines, and refineries. Preliminary compatibility with railcraft tanks (through the valve), machines and carts. More will come, including creosote oil buckets. Preliminary compatibility with Forestry machines. Support for Forestry liquids will come. Added rubber bucket if IndustrialCraft is installed. Holds one water and no lava but lasts forever. Animated graphics for ender bucket and shimmering bucket. Added configuration option for turning off all animated bucket graphics if you find them annoying. Added configuration option to disable all oil and fuel buckets (freeing up all their item IDs without having to disable them individually). Added configuration option to disable all mod ore buckets (freeing up all their item IDs without having to disable them individually). Mod Ore buckets whose ores are not installed no longer appear in NEI. All buckets (except for those which take damage over time) can now be used to fill cauldrons. Note: some forestry and railcraft tanks and machines, due to a tiny bug in their implementation, take one bucket's worth of liquid from a bucket or fill it with one bucket's worth instead of filling or draining as much as possible. This only occurs when you put the bucket in the tank/machine. Right clicking on them works properly. I'll try to get in touch with SirSengir and CovertJaguar at some point to get everything straightened out. Known bug: if you load a save which previously had buildcraft installed but no longer does and right click on a fuel or oil bucket, you will get a crash. You can avoid this if you uninstall buildcraft by specifically disabling all fuel and oil buckets with the "modLiquidsEnabled" setting. This will be fixed in the next version. Added the explosives bucket. Right click on live TNT to store it, right click again to place it again. Kaboom! Holds up to 32 TNT. Added the magma cube bucket. It performs similarly to the slimy bucket, but works on magma cubes instead. Added tooltips to most buckets. Buckets with a limited timer display how much time they have left, big buckets display their current load and their maximum load. Buckets which only go down in durability did not get a tooltip as they take damage like any other tool. Tooltips can be turned off in the config file. Infernal buckets can now be used to ignite TNT. Buckets used as fuel in a furnace will now only take one lava at a time until they are empty or there is nothing left to smelt. The amount of lava and water in buckets no longer matters when crafting obsidian as long as it is at least one. You now craft one at a time left clicking, but you can craft the maximum like in any crafting by shift left clicking. Steel bucket capacity increased from 3 to 4 because blast furnaces are actually quite some work to craft. You can now disable buckets by setting their item ID to 0 in the config. This will disable empty, water and lava types of that material. You can't disable one subtype. Attempting to pick up buildcraft oil won't destroy the oil now. Buckets made from ores in mods which aren't installed should no longer show up in the creative inventory. They may still show up in NEI. Fixed a bug causing forges to behave strangely (or to become unusable until they were picked up) when the world was shut down while they had a large bucket's worth of fuel in them. Moved item IDs much, much higher (to the 18500s from the 500s) to avoid conflicts and to make adding buckets for other types of liquids possible. New option in config to set all item IDs from a given number so people don't have to change more than 50 item IDs by hand. Fixed a bug where sometimes buckets would combine. Added another use to the infernal bucket. Right clicking into the air when it's at least 2/5ths full will apply a short 5 second fire resistance effect, saving you from burning to death or allowing you to swim a very short distance in lava. There is no warranty for user failure to judge size of lava pools. Added copper, tin, bronze, and steel buckets if a mod which implements them is installed. They hold 1, 1, 3 and 3 source blocks. Forestry and Railcraft are both available for 1.3.2 and implement these ores. Added black hole buckets which will utterly annihilate through galactic gravitational pressure almost anything you right click. Sadly, it won't do this to your enemies, only to things which are already somewhat insubstantial. In order of decreasing usefulness this includes those pesky lava bits and pieces that never seem to go away until you place a block in them, lava source blocks, water, snow (but not snow blocks), flowers, grass, ferns, nether portals, fire, redstone, tripwires, tripwire string, and rails. Crafted with an obsidian bucket, a diamond, two ender pearls, and three obsidian, this portable trash bin will last you a whopping 512 uses. There is no warranty for items lost to the unfathomable power contained within. Added clay buckets which only have one slot. Instead of having a timer like the other flimsy buckets, the clay bucket can only be used 20 times (moving 10 source blocks of either type) before they break. To craft a fired clay bucket, craft an unfired clay bucket with clay and then smelt it in a furnace. There is no warranty for broken clay buckets. Fixed obsidian recipe code so any future buckets (that don't take damage) will have the obsidian crafting recipe. This means copper, tin, bronze, and steel for this release. Added a configuration file option for disabling obsidian recipes. Fixed a bug that may have prevented right clicking on some entities. Fixed right clicking on oil in the new 1.3.2 buildcraft pre-release returning a vanilla oil bucket. Instead you'll get water if you pick up oil but at least you won't lose the bucket. Until I implement proper oil buckets this will have to do. Added flimsy buckets. They last for a limited amount of time: 20 seconds for wooden, 60 seconds for cobblestone, 5 minutes for smoothstone. Wooden can only hold water and cobblestone buckets only lasts 30 seconds with lava in them. Hold on to any of these with liquid in them when they break and the liquid will spill, with often deadly results! These cannot be used to craft obsidian or as fuel. Added icy buckets which have 256 uses. Right clicking a water block yields an ice block and right clicking a lava block yields two obsidian blocks, a much better return than turning it into obsidian directly. However, icy buckets require 3 diamonds each to craft, making silk touch picks more efficient sources of ice and large lava pools more efficient sources of obsidian. If neither of those are readily available, the icy bucket is an alternative. Added slimy bucket which is crafted with slime balls and three iron. This can "milk" slimes to get slime balls and can be used 128 times. Each slime can be "milked" once every 3 minutes and yields 1-2 slimeballs each time. Increased infernal bucket capacity to 30. Each water block ingested adds 6 uses of the flint & steel function, so it still requires 5 water to fill completely. Increased cost to require a blaze rod and glowstone instead of glowstone dust to compensate. Shift right clicking with one of the big buckets forces attempting to place the liquid even if the target is the same liquid type. This allows you to empty the buckets into pools if you don't want to create more water blocks. Gave shimmering bucket a durability of 400 to balance it. This is enough for just over 2 level 30 enchants. Now you can convert spare diamonds and lava lakes into enchantments without it being overpowered. Added emerald buckets which hold 5 source blocks. This is in between the 6 that diamond buckets hold and the 4 that gold buckets hold. Emeralds may be rarer than diamonds, but they aren't used for other recipes. Changed borders of items to have a little color, just like default minecraft items. Fixed bug where lava placed with the new buckets would not move. Infernal bucket added which holds five water. Through some demonic magic it places down fire. Shimmering bucket added which takes in lava source blocks and gives you a bit of experience. Lava is limited (unless modded to be otherwise), so this should not be overpowered. Obsidian buckets added which hold three blocks of lava or water. Gold buckets now hold four source blocks, diamond six, and ender eight. Lava buckets can now be used as fuel, lasting as much as eight times as long as an iron lava bucket depending on how much lava is in the bucket. You get the bucket back. You can now craft up to eight obsidian at a time using water and lava buckets made from most materials. Both buckets must have the same amount of liquid. One must have lava, the other must have water. You get both buckets back. Full buckets now display a full health bar instead of no health bar at all. Removed buggy milk code. These buckets don't work with milk yet, but that is planned. If your bucket is full and you try to take the same liquid type, it no longer places one of your liquid blocks. Unchanged for iron bucket, which will still place the liquid even if it will be wasted. Added shapeless recipe to upgrade diamond bucket into ender bucket using four eyes of ender. This mod was translated to Spanish by JulioTranslations. He's great. If you want to translate this mod to another language, shoot me a PM, or just translate this and PM the translation to me. After completing this, I found bucket-craft, a mod for 1.2.5 with more features than this one. Any similarities are coincidental. This mod was instead inspired by a thread on the suggestions board by TicTacCreeper. You can install and play this mod in any way you desire, but you can't distribute a modified version without my express consent. If you want to put it in a mod pack and release that, go for it, just shoot me a PM to let me know. If you want to reupload my mod somewhere, that's fine as long as you PM me on the Minecraft Forums to let me know where it is. If you want to reupload my mod somewhere and claim it as your own work, that's not ok. If you want to make money off rehosting my mod, that's fine as long as you give me credit as the mod's creator and inform me via PM. If you have any questions about a situation I have not covered, feel free to PM me and ask. Nice mod! What indications do you get on how many stuff is in the bucket, or if it's full? The damage bar fills up as the bucket does. I've updated to v0.2. Additions include the Infernal bucket, Shimmering bucket, and Obsidian bucket. Check out the full change log out and give it a try above. Thanks for the spotlights, guys! I've added them to the OP. Hey, this is a nice mod, but the infernal bucket is kind of useless. Flint and Steel places down fire, so you don't really need that. I have to agree with you. The infernal bucket seems highly inferior compared to Flint and Steel. Having to refill your bucket every four uses seems like a pain. Perhaps it should have a different special ability. Or maybe the recipe should be changed to glowstone blocks and nether brick instead glowstone dust and netherrack. And it's capacity should be increased to 10 or 14. I may be 15 years old, but don't talk down to me like I'm some ignorant adolescent that has no idea what he's saying. I'm not afraid to tell my age or gender, please don't make me change my standpoint by acting like you're superior to me. Thank you. Thanks, that was a wonderful mod spotlight. I've added it to the OP. What seems to be the issue? If minecraft won't start up, post the contents of the ForgeModLoader log file in your .minecraft directory inside of [spoiler] tags so I can try to figure out what's wrong. hey, i can't get your mod to work.. i have TMI installed and the forge that's required, but as where to put the diamond buckets mod?? Drag the diamondbuckets_v0.2.zip file to the mods folder inside of .minecraft to install the mod. I'm sorry to hear that. My idea was a flint and steel that can be recharged at any infinite water source. But I think you're both right because the flint and steel has 65 uses which provides far superior functionality to the 5 of the infernal bucket. What if I upped it to 40 uses, which is just over half as many as the flint and steel, and made each water source block right clicked increase the charge by 20 instead of 1? It was 5 uses for the Infernal Bucket? My bad. Anyway, how about instead of 40 uses it wold be 30 uses and instead of 20 uses per charge it would be 6? That way it still keeps the basic functionality of it needing 5 water source blocks to be fully charged. Of course you might have to change the recipe of it so it is not too overpowered. Perhaps you could consider my recipe? Of course the final decision is up to you. After all, you are the creator of this fantastic mod. Quite interesting. Is this your first mod? The 30 use infernal bucket with 6 recharges per click seems good to me. But if people were to use a bucket with an infinite lava source, they could easily use a shimmering bucket with it and have a truly infinite source of experience. Damn it, You're faster than me!